A potter who has left behind a large collection of works never shown in public before is amongst artists whose work is on display at an exhibition in Birmingham. Val Gill was originally from Smethwick, but had lived in Birmingham for many years. She died on October 11, aged 63, leaving many of her creations in her flat. She had studied at Liverpool Art College in the early 1970s and later worked behind the scenes at Birmingham Repertory Company and Birmingham Hippodrome. In more recent decades she had enjoyed working on her pottery skills in classes and then in the studios at the mac in Birmingham. Some of her work had been seen in a students’ show at the mac back in 2006, but she had always declined being exhibited more generally; however friends, some of whom worked alongside her at the mac, have put a number of her creations on show in the Midlands Potters open exhibition at Woodbridge Gallery in Moseley until 3pm on Sunday, December 4. Visitors can take one of her works away with them for a donation of a least £10 which will go to a cancer charity. The works are in her very recognisable style, including some small, symmetrical raku works and others with a shiny glaze. There are also larger, typically asymmetrical, pieces, some of which look like different pots works merged together to create one. They are in a range of colours but nothing too dramatic, mostly blues and aqua, or sandy or grey earth colours. Some which look like vases are larger at the top than the bottom, and others have a Moorish look to them. The exhibition over the two floors of the gallery also features works by other Midlands Potters members. 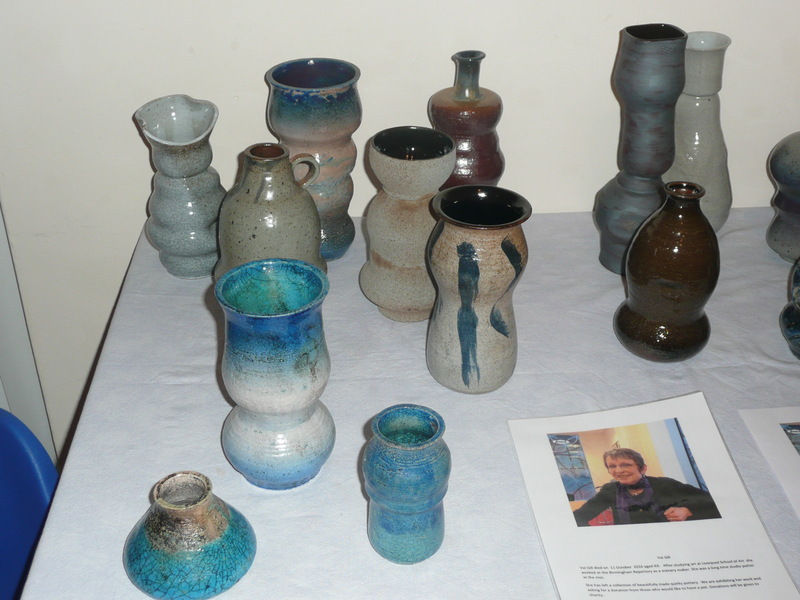 Karen James, one of the friends behind displaying Val’s works, is showing attractive bowls and vessels with swirly, attractive internal glazes. Sally White’s practical creations including jugs feature ship motifs, and Jennie Howe, who had a MA in fashion and textiles has created ceramics with a frilly look to them. Graham Taylor’s works are ornamental chunks depicting the sea with boats sailing on them, and in the room upstairs Mirta Vargas’s works are influenced by pre-Columbian art, with small bobbles of clay and layers built up defining the shape. Apart from Val Gill’s works being offered to raise money for charity, all other works are for sale. 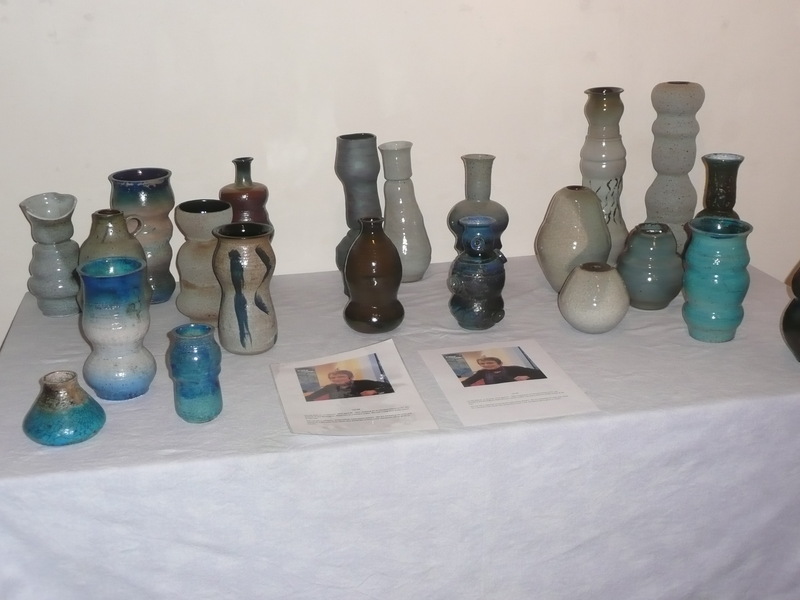 It’s an interesting exhibition showing the variety of work being done by potters from across the Midlands.